Well the forecast was for a 16mph north easterly wind and I couldn’t believe just how perfect it was until I approached the Greensward and could see Colin’s lifter kite flying inline with the Greensward. There was a bight blue sky with hardly a cloud in the sky. 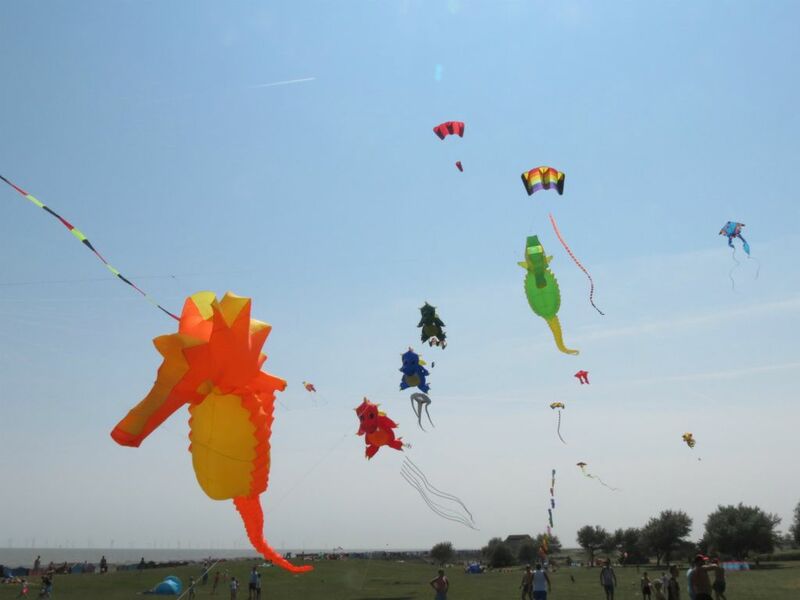 Time to get some kites out, we initially decided on the dragons as although it was a reasonably steady wind it was a bit lumpy and with the odd gust. Colin flew Mark’s Alien with his tails on the line below. As it was a good wind I was keen to get Norman’s beautiful Snowflake kite up in the sky. It took Pete, Colin and myself a little while to figure it as it is a complicated kite to put together out but we got there in the end and it was certainly worth the effort as it looked beautiful against the blue sky. We tried flying Larry the Lobster but there was too much turbulence lower down so we swapped it for a couple of the 10m Sea Horses. With three flow tails, a Rokkaku and several other kites in the sky we had one of the best displays up for a club flying day. It was so lovely to get all the appreciative comments from the general public throughout the day. And we were amazed at how many football and cricket games and picnics were going on beneath the kites, it was a good thing that the wind stayed constant! We thought that we had had a good fly last month but we all agreed that this was indeed the best club fly we have had at Frinton.